The idea for a drilling technology to rapidly access the deep ice sheets in Antarctica and Greenland has circulated in the science community for some time. Early ideas for fast mechanical access in ice and subglacial bedrock were described by Clow and Koci (2002, Ice Drilling Technology), but cost and technology limitations prevented development. Initial discussions to develop a RAID-type drill took place at a workshop in Herndon, Virginia in 2011, sponsored by the Ice Drilling Program Office (IDPO). A limited set of scientific requirements was defined at this time. Subsequent planning and technical feasibility of different drilling technologies took place in late 2011 and early 2012, facilitated by the IDPO and the Ice Drilling Design and Operations office in Madison, Wisconsin. These meetings resulted in a feasibility study provided by the IDDO. A proposal to complete a detailed design for the RAID drilling system was submitted to the NSF in early 2012 and funded later that year. 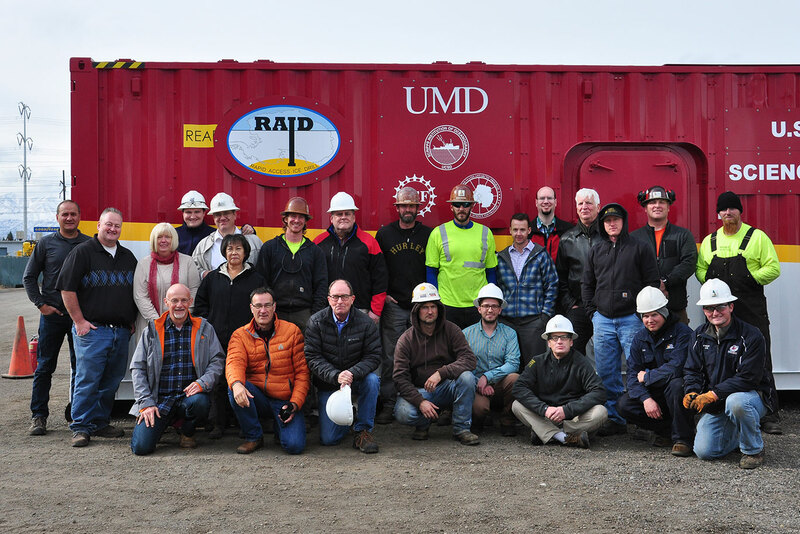 After a competitive bidding process, the University of Minnesota contracted with DOSECC Exploration Services (DES), LLP, based in Salt Lake City, to lead the design-to-build effort. DES has significant past experience with scientific drilling, including design and operation of one-of-a-kind drilling rigs in remote land-based, lake-based, and offshore systems. Intensive design work by the RAID science team ensued through most of 2013, culminating in completion of a design package submitted to the National Science Foundation for review in early 2014. Funding of a second proposal by the NSF allowed the development team to proceed with fabrication and build-out in 2014-15. After integration of the major components and field testing in Utah, the RAID system was shipped to Antarctica by vessel. It is currently staged in the McMurdo area undergoing performance tests in order to validate its readiness as a science research platform.